Fashion refresh of the L1962 Smart Stages Swing - with the same features that include: 3-in-1 with full-size open-top swing, an infant seat and a toddler rocker; seat easily removes from the swing frame so mom can move baby around the house or can put the swing frame away when child is older; 2 soothing speeds, 5 songs, volume control, and a toybar with two removable toys. Infant seat has fold-out kick-stand for feeding or sleeping. 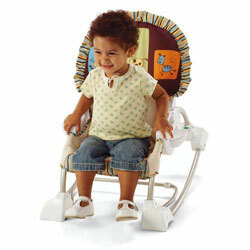 As baby grows, the seat also converts to a toddler rocking chair that accommodates a child up to 40lbs. Measurements 33" x 27" x 33". Designed to soothe, entertain, and provide a safe space for baby to rest, play, or eat, the Fisher-Price Smart Stages 3-in-1 Rocker Swing holds babies weighing up to 25 pounds, while the rocker is appropriate for children weighing up to 40 pounds. Compact, versatile, and packed with features that encourage healthy sensory development, the Rocker Swing promotes comfort and security from birth until your child becomes active and can climb out of the seat. 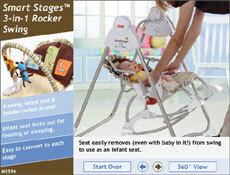 This toddler device provides a swing, infant seat and toddler rocker all in one. View larger. The Rocker Swing offers a 3-in-1 design with a full-size open-top swing, an infant seat, and a toddler rocker in one durable and stable unit. 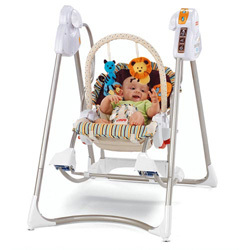 Easy to use, the swing has two speeds and five songs to calm cranky babies and engage their auditory skills, and a toy bar with two plush animals removes easily for more play or set-up options. In addition, as your toddler pushes with his legs and feet to rock, he fosters gross motor skills. Featuring neutral colors that complement any decor and suit either a boy or a girl, the Rocker Swing is powered by four "D" batteries (not included) and includes a fold-out kickstand for stability while baby is eating or sleeping. The Rocker Swing has an easily removable seat that allows you to take baby around the house in the infant seat. As your baby grows, the swing frame folds and stores away so you can use the Rocker Swing as a toddler rocker--ideal to help your child wind down before naptime. For added safety and convenience, the swing boasts easy-release seat handles, a machine washable pad, open-top access to baby, a volume control, and a three-point restraint system to ensure baby's safety. The Rocker Swing measures 15.8 x 9 x 26.2 inches (WxHxD) and weighs 21 pounds. Easily converts to each stage -- swing, seat, or rocker. View larger. The seat is a snap to remove -- even with your baby in it! View larger. Fashion update of the Smart Stages Swing! Features also include 2 soothing speeds, 5 songs, volume control, and a toybar with two removable toys. Infant seat has fold-out kick-stand for feeding or sleeping. As baby grows, the seat also converts to a toddler rocking chair that accommodates a child up to 40lbs. My son is 2 months old and this has been a life saver. While it's a great design and pretty easy to assemble, you should be aware of few things that may happen with your baby. When he was about a month old, it was great. Once he started developing awareness to colors, he would freak out with the grey colored poles. However, the infant seat conversion is awesome. I assume the toddler rocker will be great when he reaches that level. We bought this swing for our 1 month old (12 lbs. at first use). I love that its two products in one - saved me some money, and some space. The baby likes the swing as well - the lower setting has plenty of power for her size, just need to give it a little push to get it started (as the directions say to do). The toy bar is too high for a baby to reach out and touch the toys, but perfect for a small baby to look at - like a mobile in a crib idea. The seat angle is a little awkward - I would give the swing 5 stars if it were adjustable. As it is, when it is in "swing" mode, I need to put a rolled up blanket against the side of the seat so baby can lean her head against it if she falls asleep. When in "seat" mode, it is perfect for a small infant to look around, doze, etc., but seems that it would be way too tilted back for feeding. Maybe it won't seem that way as she gets bigger, though. The seat-to-swing transition is pretty slick, but I wouldn't recommend doing it with the baby actually in the seat until you get the hang of it - it can be a little awkward at first. The swing took about 15-20 minutes to put together and seems very sturdy. The fabric seat is easy to remove for washing. Glad we didn't waste our money on this one! We received this swing as a gift for my son, and are not overly impressed by it. 5. If your infant's hands wander too much to the sides, they can get caught between the metal bars! 6. Careful when you wash the material, the color does run-even in cold! (Our seat's cover is yellow, hence the yellowish tinge to several other things that were washed in that delicate load). 3. Easy to wash the seat cover if it gets dirty (but the light yellow isn't the best idea since this seats best use is as a rocker to an older child). 4. Good battery life (could be because we do not use it very often). When our swing arrived I was actually kind of disappointed since it didn't seem to swing at all even on the highest setting. I called Fisher Price to complaint about it and they told me to change the batteries since that was the most common reason for the swings not working properly. I did, and nothing seemed to change. So I called them again wanting to return the product, they told me that they would send me a new motor part in order to fix the problem. I was very skeptical, but when the part arrived (next day, bravo Fisher Price!) and I replaced it, it started to work wonderfully, maybe even a little too fast for my newborn, but he seemed to like it. Every time we need a moment for ourselves we know the swing will work his magic. Hey, sometimes he enjoys it even without the swinging motion, so it's a convenience that I can transport the little chair to spots the whole swing couldn't fit. I also love the idea of being able to keep the rocking chair once our son gets too big for the swing. My husband and I brought this for our first. It was easy to assemble, and the colors are nice.I dont particularly like the two dangling toys, but i'll get some other ones. The music is nice and the motion is smooth and comfortable.